Working in Antarctica gives you the best way of getting to know and see the continent in all its moods. What jobs are there available? for how long? and how do you go about getting one? other than offering the advice and information found on this page. You've seen the pictures, watched the videos, read about about it online and in books and now you've decided you want to actually go to Antarctica. Maybe you can't afford to go as a paying passenger or maybe you want to experience the continent more fully, more closely and most of all - during the winter months when no tourist can visit. Speculative postings to Antarctic and job seeking forums from people who are hoping that making it known that they are available is not sufficient to find a job. Sending me your resume or cv won't work either (so please don't). Reality check 2 - with some exceptions, Antarctic personnel are specialists in a particular field, enthusiastic generalists can get jobs in Antarctica, but the field of applicants is that much larger. But people obviously DO get jobs in Antarctica and some of them get to go down again and again. Reality check 3 - It is expensive to transport personnel to and from Antarctica, so while 3-6 months may suit you best, longer than this makes more sense for those who pay the bills. But then again, there are some positions for 3-6 months going as well as the longer contracts. 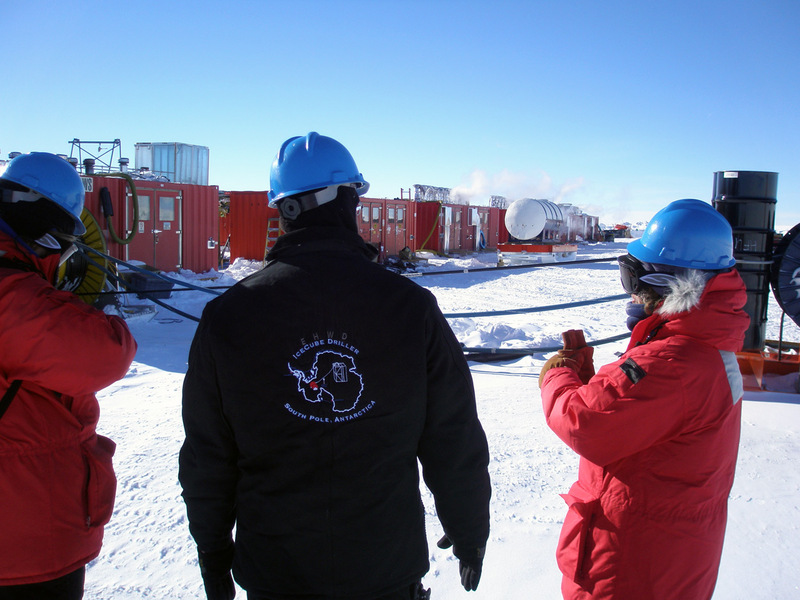 Scientists and support workers combine to enable Antarctic science, here at the South Pole, a major project drilling deep into the ice to deploy neutrino detectors. 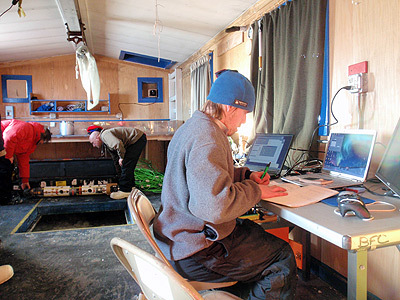 The inside of a hut placed over a dive-hole cut in the sea-ice near McMurdo base. Jobs in Antarctica are almost exclusively on National Research Stations. These stations vary in size quite considerably, typically having 40 - 50 people in the summer months, from around November - March, and a much smaller winter crew of maybe 10 - 20 from March to November (ish). There is a big American base at McMurdo that is much larger than this however. About 5,000 people visit Antarctic stations each year from about 27 different countries with around 1,000 of them remaining over the winter months. Winter means isolation when there is no transport in or out and contact is only by various electronic telecommunications. 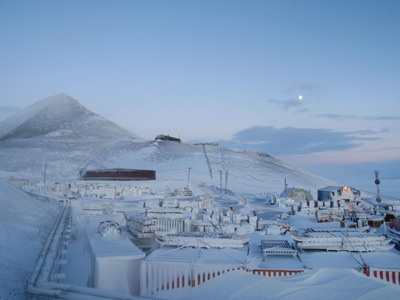 McMurdo base, a deep-south coastal station the morning after a blizzard. What are the jobs that are available? Chemists - studying snow, ice, freshwater etc. ...and a few other sorts of "ologists"
Releasing high altitude balloons from Halley station to investigate the earth's radiation belts. 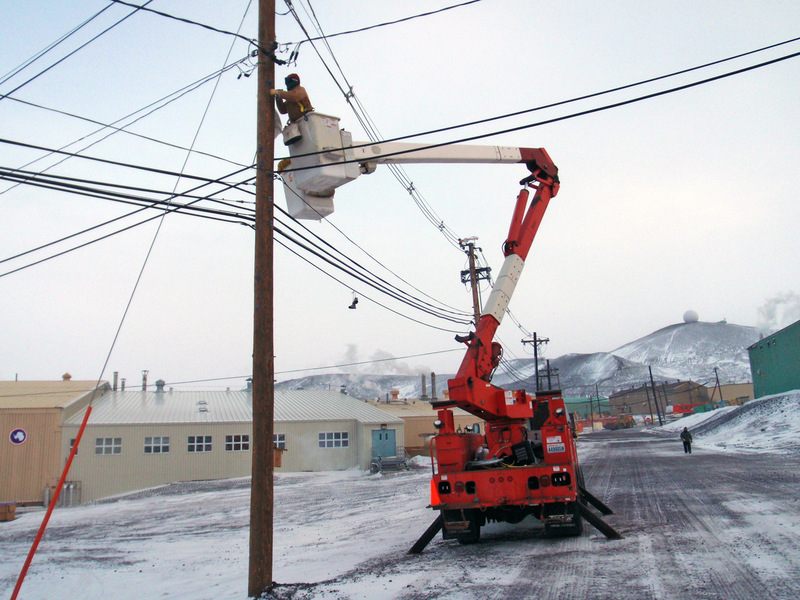 McMurdo station is more like a small town and so needs much of the infrastructure that you expect in small towns anywhere else in the world. The large US base at McMurdo also has positions for generalist staff, cleaning, food preparation etc. "There are attorneys, judges, pharmacists, and PhD's working as mechanics, janitors, galley slaves, housing department and shuttle drivers." Your experience of Antarctica will depend very much on your job. Scientific staff will generally have more interesting experiences as their jobs often take them away from the base more. There are exceptions though, an atmospheric scientist will have little reason to leave base for the purpose of doing the job, and a boat handler will spend large amounts of time off base. If your job involves transportation in any way, then you will see more of Antarctica than anyone. On many bases there is the expectation and requirement that all staff will fulfill generalist roles such as unloading ships, washing-dishes, night-watch, cleaning the base, dealing with the trash etc. The smaller the base, the more varied of these housekeeping jobs you will be expected to do in addition to your own specialist tasks. Personnel are screened carefully for their psychological and physical suitability to work in the demanding environment of Antarctica. They must be in very good physical shape as full medical facilities are far away in distance and also often in time. Other jobs - you may have guessed by now that there are lots of jobs for which there is no requirement in Antarctica. So you might be the best car salesman, lawyer or basketball coach in your town, but you won't be getting a job in Antarctica doing those things. The number of non-required occupations is too long to list, if you want to work there you need to be a required specialist or take a non-specialist job. As it's a case of supply and demand, and the supply of people ready to work in Antarctica is far greater than the demand for personnel, the answer to this question is not the great fortune that is sometimes imagined. In general, personnel in Antarctica on a National Antarctic Programme, supply ship, contract work etc. will be paid pretty much the same as they would for doing the same job back in their home country, often with a small extra bonus but forget any idea of 2x or 3x salary multiples. There's not a lot to spend your money on. Taxation is often less than at home (varies by country) . Accommodation, food and much of your clothing usually including all specialist clothing are provided for you for free . So you should be able to save up a good proportion of the money you are paid to take back home with you. A bedroom at Halley base, facilities vary by base, though typically sleeping accommodation is quite small and used just for that purpose, many personnel on a base will also have an office or other work area, there are also public areas on base. Retreating from base life into a private space is not encouraged and is not good for base-life or the individual. How do I go about getting a job in Antarctica? The first step is find the National Antarctic programme of your own country, if only because interviews will usually be held in that country. Some countries also have a strong preference for their own citizens or you may find that foreign nationals are simply not considered. Some country's Antarctic bases are run by the military or have a strong military presence and you will therefore stand a much better chance if you are already enlisted. Listed below are links to many points of first call. Many countries simply do not have an Antarctic programme or it is very small, so unless you have relevant professional skills and work in a country that does, you may find that your chances are very limited. Are there any jobs other than with National Operators? Port Lockroy, or Base "A" is a British historic base situated on the tiny Goudier Island off the Antarctic Peninsula. It was established in 1944 and occupied until 1962. The abandoned base was restored in 1996 as a "living museum". The jobs require a compulsory interview in the UK plus a mandatory training course. No expenses for former are payable. No age restrictions but sucessful applicants need to pass a medical and to be fit and strong. Disabilities cannot be accommodated which would prevent someone from doing the job. Applications are invited during a short window each year of around a week or two in late February. To put things in perspective, there were around 1500 applicants for 4 positions in 2015 following a documentary that was shown on PBS and the BBC. In 2014, there were 82 applicants for the same 4 posts. The Antarctic programmes from a number of countries, such as UK, USA, Australia and New Zealand have supported "Artists and Writers" initiatives at various points in the past. At the time of writing (February 2018) these are now becoming active again having been dormant for a few years, New Zealand, Australia and the USA now have active programmes once again. The Scott Polar Research Institute in the UK also sponsors an Arctic and Antarctic artist for a few weeks each year. The national sites above often have links to diaries of the bases that are written for the family and friends of the personnel on the bases. These tend to be a rather sanitized official version of events and not terribly interesting unless you know the people involved. There are also a large number of unofficial blogs and web diaries written by people in Antarctica that come and go, frequently being started with good intentions but often abandoned not long afterwards. Some are very good and give an excellent insight into life in Antarctica. Because such blogs and diaries appear and also mysteriously disappear without warning I no longer link to any in particular. Google is your friend here. I personally went to Antarctica with the British Antarctic Survey on a small base and reading through some other diary entries am quite astonished at how different an Antarctic experience people have on the various bases. I am a mountaineer and a photographer, and have managed to be shortlisted for a position as Field Assistant with BAS (UK). If you have a minute to spare, I would be very grateful. I have a good idea of what they are looking for when it comes to technical skills (glacier travel, crevasse rescue, etc. ), but not so much for the "softer" personality questions... If you have any advice that would help me come better prepared, it would be extremely welcome! You need to demonstrate self reliance and a high degree of capability, though not be too proud to ask if you get out of your depth (and be able to recognise when you are out of your depth) or encounter a situation you don't know about. They may give you a scenario to talk them through with this. You need to be able to be flexible and make things happen when they can happen rather than stick to the schedule. You will be in the field with someone for weeks, possibly months, so you need to be very easy going and easy to get on with. There's not a lot you can do about this, be yourself, if this is not you, then the job is perhaps not for you. You should be quite self contained and not in any way "needy", same as the last point really. You should like other people, you "get away from it all" in Antarctica, but you certainly don't get away from people, crowds - yes, but people definitely not. Above all be yourself, if you don't get the position this time then don't let it put you off applying again - I know many people who got through the second time (including myself). The interview starts when you enter the building, not when you sit down in the room. I want to go not this austral summer, but next, and when I go (theoretically) I'll have a master's degree in mechanical engineering and a bunch of sundry skills. But I've sent my resume to anonymous hiring sites before (i.e. the Raytheon outfit) and I've NEVER known that to work. Neither I nor anyone I know has even once been hired by submitting to an online server. So I'm worried that when the time comes, and I submit my papers - qualified or not - they'll be parsed by a computer, glanced over by a suit who already knows who he's sending, and tossed into the Antarctic trash bin of history. I thus ask those who know, realistically: I'm a multi-talented fellow, and a hard worker... but what are my chances? What are they REALLY? Is there an inside track to the Antarctic Circle? And how do I get on it? Really good questions! I think your chances of being hired are greatly enhanced by attending Raytheon's Job Fair in April (as from 2013, job fairs have now ended as Raytheon no longer have this contract). I did and was hired. I'm returning for my third season in October! I have been told they receive over 30,000 applications for about 500 positions. So being at the Fair, getting to know the persons for whom you hope to work, getting their extension numbers, names, email addresses really is a foot in the door. When I worked the Midrat shift in the galley, six of the ten of us had masters degrees! No, not in culinary arts! We had school counselors, teachers, school psychologist and me, a nurse practitioner. So be willing to take ANY job. There are attorneys, judges, pharmacists, and PhD's working as mechanics, janitors, galley slaves, housing department and shuttle drivers. Some folks have said to me, oh, I don't have the money to go to Denver for the Fair, or I'm not sure I can go. Well, do you want to go to the Ice!!!??? You do what you gotta do!! Good luck! I have a great job record and have thought for a long time that working in Antarctica would be an interesting thing to do ! It would seem to me that there would be more of a need for help due to the cold and harsh weather one must endure down there ! Your site makes it seem like a real narrow chance to go there! I think that's a shame if that's the case ! I have been in Hi-Tech for 19 years and done lots of heavy work too! If there is any need for a strong smart guy such as myself I would sure like to give it a go! If the American or British stations can't use me, perhaps I could work at the Russian station as I have a Russian wife and can speak it some ! Thanks for your time in reading this! It's a case of supply and demand, for every job available, there are dozens if not hundreds of people who would be prepared to do it. So the recruitment is biased towards those who REALLY want to go to Antarctica as well as being capable of doing the job, the recruiters really can pick and choose. You need to apply through Lockheed Martin, the US company that currently deals with logistics. If you don't get in straight away, keep plugging at it, they like persistence too, shows it's not just a short-term idea you've had. I got the second job I'd applied for and know of many others who were turned down at least once before they were offered a position. I Have a question that doesn't seem to have been answered here. I'm interested in getting a job in Antarctica, but realise that everyone else is too, and so I figured that my best bet would be as a scientific guy. How do I go about getting information on research jobs in Antarctica? All the information seems to be about cooks and carpenters and mechanics. Scientific jobs are advertised in the scientific press usually. You could try the website of your national programme as there are often the latest vacancies advertised there. Also scientific jobs are not always offered by the Antarctic programme directly, but by a University with secondment to the Antarctic programme to go south and carry out the research. When I went to Antarctica as a marine biologist I was actually employed by St. Andrews University and seconded to the British Antarctic Survey. The overall impression is that scientists are supposed to be more interested in their line of research than in just going to Antarctica which is "coincidental". Your scientific discipline and career so far are obviously extremely important, and while there may be dozens of applicants for a particular generalist support job, there may only be a handful for a scientific post - BUT that's because of the specialist nature of the job. There can be (and are) many well qualified and experienced scientists who would love to go to Antarctica, but there's just no jobs in their particular discipline. So as a scientist, there's less chance of a job coming up that fits your experience, but if it does - the odds are narrowed in your favour. You should research the science programmes currently happening in Antarctica and investigate the qualifications needed to be a part of them. A retired Registered Nurse living in Princeville, Illinois. Sharon always wanted to go to Antarctica and in September 2000, she did just that. After attending a job fair in Englewood, Colorado. for Raytheon Polar Services she was one of the few lucky people to be hired. She has been six times to Antarctica to work, most recently in October 2006. Sharon also has a Masters degree from the University of Illinois, having become a nurse after her three children entered school - "so I was a late bloomer!" She now has grandchildren and turned 65 in October 2003 on the Ice! "Again, blooming late!" Sharon's job was to drive shuttle buses around the US McMurdo base in the Ross Sea area of Antarctica. In the Antarctic summer from October to February when she was there, there are about 1,000 people on base. A very similar size in fact to the small rural community in central Illinois where Sharon lives. 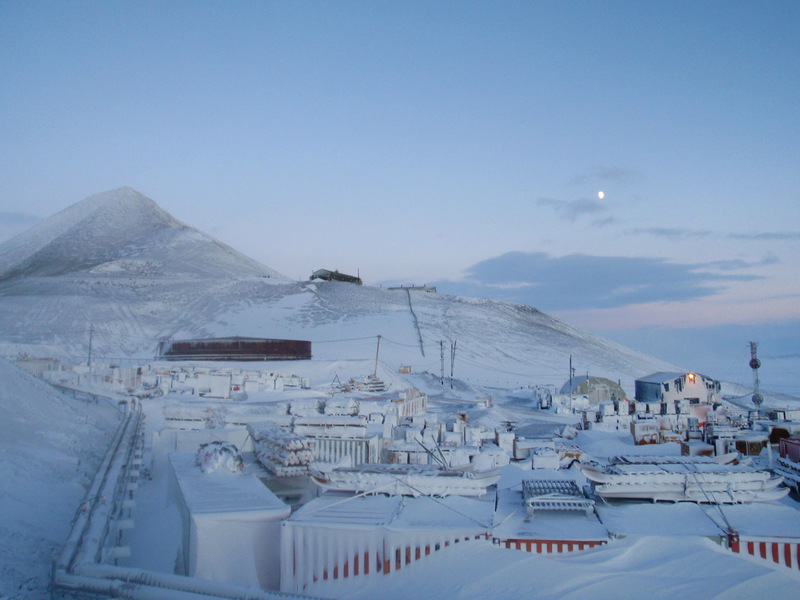 Not much to report from McMurdo Station, Antarctica. Cold and windy, planes can't come down from Christchurch, NZ, so many workers are stranded there. Temperatures have been about -10F to -20F with wind chills to -60F or so. We actually had a Condition 1 in town the other day. Unusual! Must stay where you are, not go even from one building to the next. Condition 1 usually only occurs away from Mactown, at the airfields of up in the hills. My job is going very well. I love driving shuttles!! I took some carpenters out about 10 miles onto the Ross Ice Shelf the other day in a Delta, the big orange vehicle with 5' tires. The passenger section and engine section are articulated from the driver section. The driver, me, sits forward of the front tires! The are building a shelter for the LDB, Long Duration Balloon, project. The scientists send up a balloon probably in December or January to 120,000 feet, the edge of outer space. It circles counter-clockwise Antarctica collecting data to be analyzed later at Washington U. in St. Louis. I learn so much and hear so much that there is never a dull moment. I know we have a cushy life here compared to the early explorers, but last Thursday, a woman decided to walk/climb up Observation Hill, a 900 foot lava hill. Well, she went alone and did not take a radio! A big no-no. She lost her footing and slid on the lava about 20 feet, then rolled over and slid another 40 feet, loosing a shoe and gloves in the process. Luckily, a group of hikers came along after about 1/2 - 1 hour and found her. She has frostbite on all 20 digits!! And her one heel is purple/black. She is confined to her room, visiting medical for dressing changes and morphine and debridement daily. She is not out of the woods yet! She could see shuttles going to Scott Base that night and waved and yelled, but with howling winds almost always, nobody saw or heard her. She's lucky to be alive - and only right on the edge of our buildings!